I’m getting ready to attend the NYSAIS Emerging Leaders Institute next week, and am thankful that my school is giving me the time away from our start-of-year orientation to attend it. We had summer reading to do, and I often plan on doing event-specific reading immediately before it’s due for two good reasons: 1) I tend to procrastinate, and 2) I like having readings fresh in my mind when I need to talk about them. Oh, and I procrastinate. 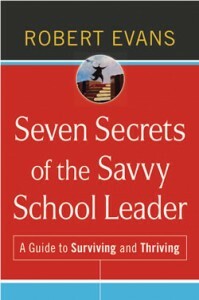 But I just got finished with the first of the books, Robert Evans’s Seven Secrets of the Savvy School Leader. It’s a good read for anyone in any sort of school leadership position, and was a great practical follow-up to a book Michael Fullan’s The New Meaning of Educational Change, which I just finished in a grad school course. Fullan’s book made a lot of sense to me, but Evans’s book just made a lot of practical sense. If we truly want schools to become learning organizations, their leaders–and the people to whom their leaders answer–need to avoid perfectionism, to see some level of error as inevitable in an endeavor as complex as schooling; to see it, in fact, the way good teachers do when working with students, as an opportunity for growth. I still recall the example of a principal I’ll call Jane Green, whom I met long ago, halfway through her first year at an impoverished, low-performing urban elementary school. “What has surprised me most,” she told me, “is not how bad this school is, but how good it is, given what it’s up against.” In one sentence, she began to recast the school’s entire situation. Such a great example for school leaders who think that their job is just to say something like “We have to take our school from here (low point) to here (high point). I know people who do this, and all it serves to do is frustrate people who have been trying to get things done who don’t have a seat at the larger school leadership table, whose contributions to the institutional history were being devalued. How does this motivate anyone to raise their game? Everyone needs encouragement, support, and motivation for continual improvement. I love this stuff, or at least the stuff that makes sense. This entry was posted in Uncategorized on August 18, 2011 by basil.